It may seem either ironic or a harbinger of things to come that the man, who in 1889 built the first official golf course in Germany, was called Major General Duff. His diminutive 9-holer in the municipal park of Bad Homburg prospered for a while, despite being labelled "Bad Humbug" by Scottish expatriates. However, in the mid 1970s it lost 3 holes and soon after fell into disrepair. A group of local golfers took it over and founded a new club, biding time until a regulation size layout could be obtained. 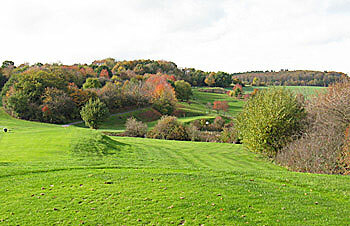 The members were soon split into two factions, one of which wanted to move to a somewhat restricted site nearby and developed today's Golf Club Bad Homburg (New Course). The second faction continued to operate the 6-holer, now called the Old Course, while venturing further afield to a more generous property in the Taunus hills. They hired Donald Harradine to develop a routing on this spectacular, but rather remote piece of land in 1979. Eight years later the golden ball was struck and the newly established Golf Club Taunus-Weilrod gave the Old Course back to the Bad Homburg club, which runs it to this day. Donald Harradine was the go-to guy in Germany for difficult sites and his effort at Weilrod is cliff-hanging golf at its best. The architect, never one to miss dramatic opportunities, took an especially uncompromising stance here. The motto seemed to be "golf first" and "conventional wisdom later". All four par fives are on the front nine and there is hardly a hole that cannot be completely botched by just one small mistake. Former German Head of State Walter Scheel, who played on opening day, is reported to have uttered "oy, oy, oy" on the breathtaking 14th tee and proceeded to blast his ball into no man's land. The course at Taunus-Weilrod Golf Club is full of exciting shots, scenic views and death-defying challenges that "could not be built today". There are certainly some tight or even penal spots and the greens are small. The wild routing can confuse to the point where it's hard to settle down into a harmonious flow. But the open-minded golfer will likely come away uplifted after tackling these 18 holes or at least entertained. As a club member I was delighted to read this report.Your research into the clubs short history and description of the course are spot on!I have played hundreds of coures all over the world and very few can boast " no two holes are the same"